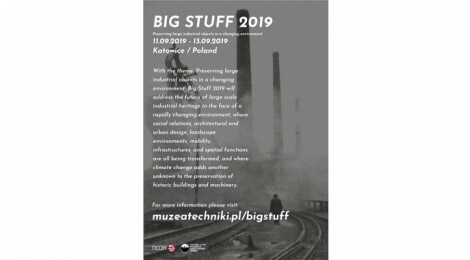 Big Stuff 2019 will address the future of large scale industrial heritage in the face of a rapidly changing environment, where social relations, architectural and urban design, landscape environments, mobility infrastructures, and spatial functions are all being transformed, and where climate change adds another unknown to the preservation of historic buildings and machinery. Big Stuff is a triennial conference focused on the particular challenges of preserving and interpreting large technology objects. The first Big Stuff conference was held in Canberra, Australia, as a gathering of people who grappled daily with the challenges of technology objects that were too big to fit in showcases, too big to be handled easily, routinely tested the limits of floor loadings and expense budgets, and brought up awkward questions of operation versus static display. Conferences focusing on industrial built heritage are a regular occurrence, but meetings that delve into the different ways to preserve, restore and display the machines that they once held are a rarer beast. The first Big Stuff meeting was highly practical, with papers covering the details of significance assessment, maintenance, and handling methods. It also challenged received wisdom on the need to remove original nitrate doped fabric from aircraft, or the need to strip paint down to the metal and repaint it. The papers presented at the conference demonstrated that elderly materials, that would not function well in a service environment, are often just fine in a heritage environment, and keep the history and provenance of an object intact. The meeting clearly filled a gap in the heritage world, and in 2007 it was held again at the Deutsches Bergbau (German Mining) Museum in Bochum in Germany. The first conference had focused on cultural heritage that, while large, was still movable, and indeed made to move – boats, planes and vehicles. The Bochum conference, however, focused on the super-scale heritage of the mining industry, where the machinery in many cases is also a building. This raises a different set of challenges, as while the machinery is no longer required to function, the original maintenance regimes and the operational income that made them possible are usually gone. A heritage income stream rarely brings in the cash to support permanent teams of painters, and in the outdoor environment the large metal elements of mining and smelting industries take on a colourful patina of rust – beautiful in its way, but not an authentic representation of the original life of the machinery, or a recipe for long-term survival. The 2010 conference at the Imperial War Museum in Duxford, UK, had a strong emphasis on planning, and managing people’s expectations. These issues are not specific to large objects, but large often also means long-lived, with objects having multiple owners and changes in function and operating parameters. A lorry may be in one paint scheme, but be required for a display about an earlier phase of its life when it had a different paint job, different wheels or a different superstructure. How do you keep the history that makes an old machine special, but display it in ways that audiences can understand and relate to? With the 2013 conference at the Canada Science and Technology, and Aviation and Space Museums, and the 2015 conference at the Centre Historique Minier in Lewarde, France, these threads came together, with detailed papers on conservation treatment and research sharing space with strong initiatives in risk management, planning, significance and new display development. The importance of drawing on experience, methods and innovations from other areas of conservation and heritage was recognized and the Big Stuff community began discussing how to define a distinct identity as well as connect with other communities of practice and knowledge.